RED-BACKED SQUIRREL MONKEY (AKA MONO TITI) All monkeys in this gallery are wild. 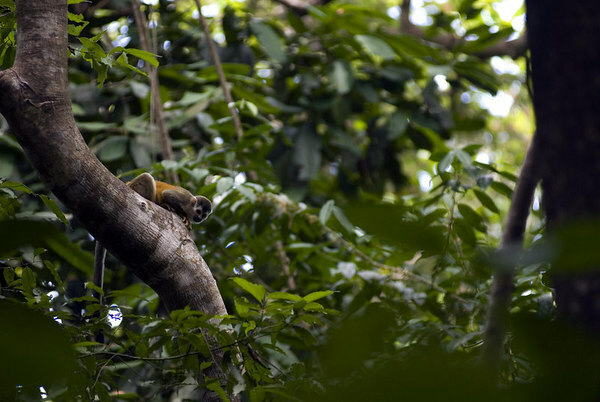 This sub-species of squirrel monkey(red backed squirrel monkeys) are highly endangered. They are found in Costa Rica along the corridor of Manuel Antonio National Park and the Osa Peninsula. They often visit local hotels and beg for food. Unfortunately, this practice is slowly killing these squirrel-sized monkeys. The sunscreen on tourists' hands acts as a poison, and some monkeys are electrocuted when they travel along hydro wires in search of tourists to feed them. I will donate 10% of all sales of any mono titi photograph to the Association for the Conservation of the Mono Titi. All images in this gallery were shot with a professional digital camera. Original captures of these photos were recorded in RAW. I offer rights managed and royalty free licenses for all stock photographs in this European Travel Gallery. Please contact me by by email or phone at (250) 475-9268 in Victoria, British Columbia to purchase a license for one of these photos. These images are also available as prints. You can use the shopping cart feature on this site to order directly from a professional photo lab.